Riders on the first day of the Friends For Life bike rally from 2015. Below, we see Peter and his bike. 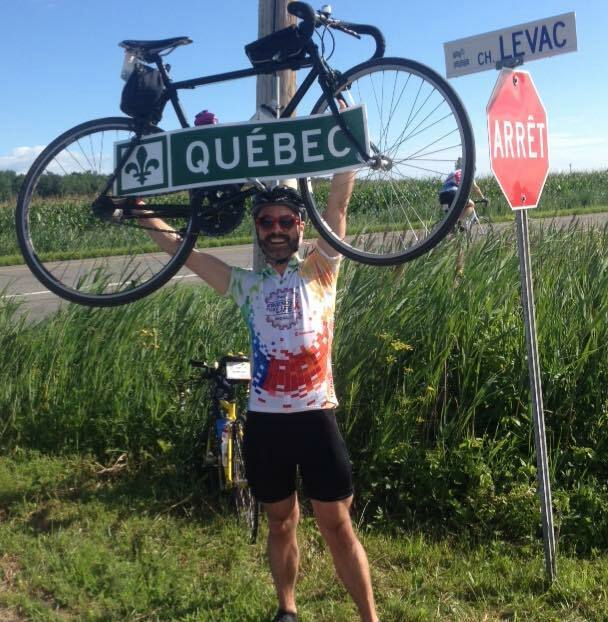 Peter, along with over 200 riders and 100 crew members ,will cycle 600-plus km from Toronto to Montreal in support of the Toronto People with AIDS Foundation. PWA is the largest direct support service agency of its kind for men, transmen, women, transwomen and children living with HIV/AIDS in Canada. Stay tuned to dandyhorsemagazine.com from July 24-29 as he documents his trip and shares the stories of some of his fellow riders and crew. Want to get a taste of what the rally will be like? The one-day ride on the first day, July 24, is still open to join for $50, and will be a 108 km ride from Toronto to Port Hope. Peter at the Quebec border during the rally. Peter has worked in arts marketing for several years but only recently realized that he needs to spend more time doing what he is truly passionate about and what he loves: And a big part of that is cycling. He has commuted to work by bike for years. Last year was the first time he participated in the Friend's for Life Bike Rally, and it quite literally changed his life. After seeing himself at his best; laughing, sleeping, eating, and riding all day, surrounded by passionate and supportive people, he realized how important cycling was to him and how alive it made him feel. Still in the process of turning his life around, Peter has become an indoor cycling instructor, resigned from his job, and is currently going through that 30-year-old period of rediscovering himself. Fresh from his first ever trip to Europe, and with a new light in his heart, Peter is excited to document his experiences on the rally this year with you.